Seafood is at its best in Goa and all along the coastal region of southern India. Beautiful fresh prawns, some of them weighing almost 500g each, are a common sight in this part of the country. I tasted tandoori prawn made from these prawns at a Christmas Eve dinner on a sun kissed Goan beach a few years ago. The following recipe is recreated based on the memories of this delightful dinner. They are wonderful when barbecued as was done in Goa. De-vein the prawns and wash them gently. Pat dry with kitchen paper and place in a non-metallic bowl. Add the lemon juice and salt. Mix well and set aside for 15 minutes. Beat the yogurt and gram flour together and add the remaining ingredients. Mix thoroughly and pour this marinade over the prawns. Mix well, cover and refrigerate for 30 minutes or overnight in the fridge. Bring it to room temperature (about 30 minutes) before cooking. Preheat the grill to high and brush 4 metal skewers generously with oil and thread the prawns onto them leaving approx. ¼” gap between each. Reserve any leftover marinade for basting. You can also use bamboo skewers, but soak them in cold water for 30 minutes first to prevent them burning. 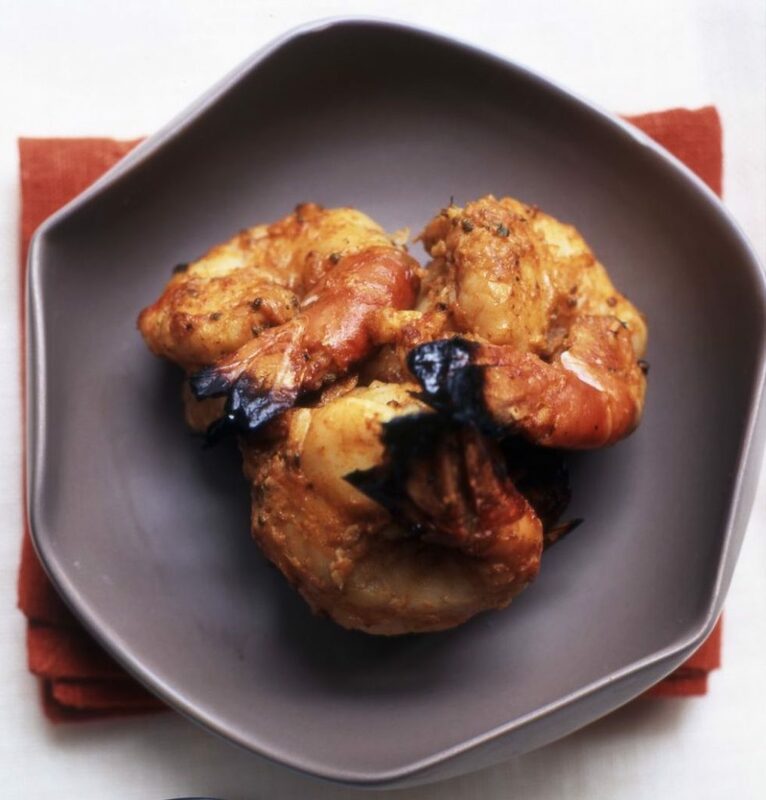 Cook the prepared prawns approximately 12cm/5″ below the heat source for 3-4 minutes. Brush over any leftover marinade and grill for a further 3-4 minutes. Alternatively, cook over hot charcoal on the barbecue for 5-6 minutes, basting as above. Serve on a bed of crisp green salad as a starter with a chutney of your choice.